Clarence E. Knepprath, age 87, of Cedar Sauk Road, Town of Saukville, WI died peacefully Monday, December 14, 2015 at the Harbor Cove where he had resided the past two weeks. 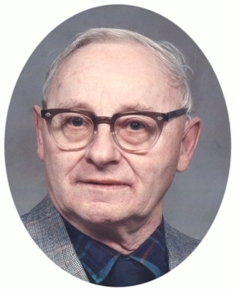 He was born on February 11, 1928 in the town of Holland, son of William and Rose Kraus Knepprath. The family farmed in the Dacada area. From 1952 through 1954, Clarence served in the US Army during the Korean War. After his discharge, he remained in the Army Reserves until 1960. Clarence was a very good mechanic and could fix most anything. Over the years, he worked for Krier Implement in Belgium, Mercury Marine and the Russell T. Gillman Company in Grafton. For thirteen years, he worked maintenance for Glenn Rieder Inc. in Milwaukee, retiring in the late 1990’s. He had been a member of the American Legion Belgium Memorial Post 412, Immaculate Conception Parish and the Catholic Order of Foresters. He always enjoyed tinkering in his woodshop. He had made some special grandfather clocks. He is survived by his brother William (Loretta) Knepprath Jr., of the town of Saukville, his sister Marion (the late Eugene) Schmidt of Sheboygan Falls, sisters-in-law Marion Knepprath of Sheboygan Falls and Carol Knepprath of Adell; nieces, nephews, other relatives and friends. Clarence is preceded in death by his sister Marcella “Sally” Knepprath, brothers Edwin and Robert Knepprath, brother-in-law Eugene Schmidt, niece Joanne Knepprath and nephew Michael Knepprath. His Mass of Christian Burial will be celebrated at 11AM Thursday, December 17, 2015 at Immaculate Conception Church, 145 W. Church Street, Saukville, WI. Reverend Patrick Wendt will be the celebrant. He will be interred at St. Mary’s Cemetery in Saukville. Visitation will take place from 9:30-11AM Thursday AT CHURCH. Memorials to Vitas Innovative Hospice, 2675 N. Mayfair Rd., Suite 500, Wauwatosa, WI 53226 are appreciated.